The eMarket theme is aptly designed for the purposes of e-commerce. The theme sports a minimalistic layout with a customizable front page. The high degree of adaptability to the user’s needs, sported by the theme is an important characteristic from the point of view of e-commerce. • Coupon Codes– The theme enables users to create coupon codes allowing attractive discounts on the products and services available on the website, for promoting their brand. The users can even delete these codes at their convenience. • Email Notifications– The theme allows users to send notifications to their customers via emails, whenever they buy something or makes a payment. They can also be notified if a new customer becomes a member. Further, the theme allows customers to interact with each other and initiate threads. Moreover, comments made by visitors are Gravatar integrated, which allows visitors to don a new avatar, which appears beside their names whenever they comment. • Payment Options– The theme sports cross payment gateway compatibility with leading payment gateways like PayPal, PayPal Pro and 2Checkout, to name a few. • Customization of Products– The theme allows users to update features of their products like the weight, height, colour and availability status of the product. 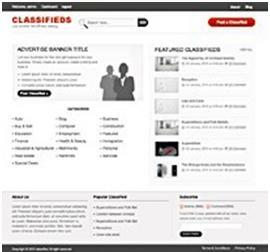 • Inbuilt Ad Monetization– This feature enables the theme to have many advertising spots to be used by desiring advertisers, thereby generating revenue for the website. • SEO Optimized– The website features characteristics that are search engine optimized. This feature enables the website to have an edge in marketability, over other websites and thereby draw more visitors. The website offers premium e-commerce solutions, with a high degree of customization to the needs of the user and can even read files of the .PSD format using Adobe Photoshop. The theme sometimes takes a little longer than usual to upload the theme due to low internet connectivity or excessive data. The theme is priced at $65 for a standard license and $99 for a developer license.